There was a feather on the ground. It was a small grey feather and I picked it up. 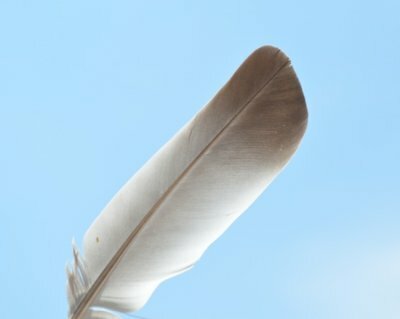 Have you ever really looked at a feather? It is amazing - light and delicate and yet very strong and able to use the air currents and endure storms. I stroked it. It was soft and built so well - the sides could split and go back together. I looked, I felt, and I thought, "This is a creation that we cannot copy. We can learn from it and copy ideas from it but we cannot make the actual feather; never mind the whole bird with all of its intricacies. And this bird which we cannot make is but one breed of a species of many breeds and this species is one of so many other life forms and so many other creations that make up our beautiful world. Our Creator did not copy this. He made the whole plan and created everything." He made Gan Eden and the first people. And he told them not to eat one specific fruit in the garden and they ate it. He did not erase his creation and start again from the beginning. He clothed this couple and sent them out of the Garden to learn how to repair what they had done so they would not be doomed to live forever in a spoiled condition. And they had children who had children who had children and more mistakes were made and then came along Noah and his destiny to escape the world destruction and become the father of the world's population. The people went on and continued to make mistakes and rebel against the 7 Laws given for all mankind. And then came Avraham, the Father of the Jews. And he had children and they too made mistakes and went down into Egypt and eventually became slaves. And then came the foremost Prophet of all times, Moses. What a humble and wonderful being and he together with his brother Aaron, following G-d's plan, brought the Jews out of Egypt and they became a Nation, the Nation of Israel. They followed G-d under the leadership of Moses and Aaron into the desert on the way to the Land of Israel. They left Egypt - an estimated 2 or more million men, women, and children. They saw the Red Sea Split and walked across on dry land. They saw the pursuing Egyptians drowned and sang the Song of Praise to G-d for all the miracles they had seen. They stood at Mt. Sinai and were terrified to hear with their own ears and see with their own eyes the voice and power of G-d. This was no story told to them by some privileged one man - this was seen, heard, and felt by all of them at the same time. The Laws were given to them; 613 Laws for the Jew in order to keep the order necessary for them to enlighten the world. The job was tremendous, to make the world ready and spread the light so G-d could live among us. The History goes on and on - some three thousand years after Sinai and we are still making mistakes even though we have G-d's specific laws on how we should live written down clearly in the Torah and analyzed and taught for years. So I look at this feather, the one we cannot even copy and certainly cannot create. And I think of an intelligent power, a Creative, Caring, Loving, Forgiving G-d who planned it all and made it all and gave it all into our keeping and I think, " How can we have the audacity to even consider thinking that we can 'do it another way' than the way he patiently explained is the way to live in this world that He created. He planned it - He made it - He made us - How can we even begin to think that we can do it another way and not his way." Look at the feather - really look at the feather. Feel the feather and feel our real true place in this world.